National Bolshevist Party activists attack King Willem-Alexander with tomatoes over the suicide of their member, who killed himself while being detained last year in Holland. The incident added to a series of awkwardness marring the Russia-Netherlands cross-year. 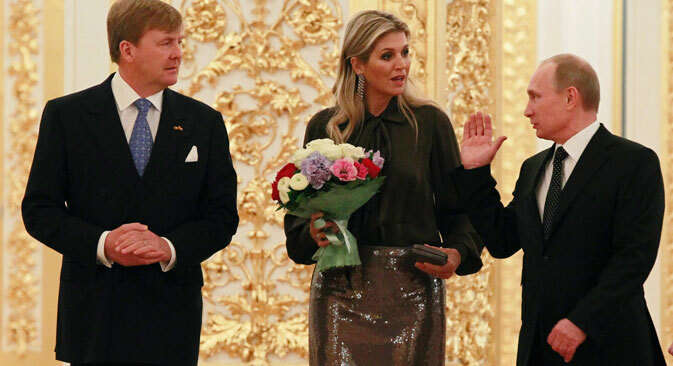 The official purpose of Dutch King Willem-Alexander and Queen Maxima’s trip to Moscow was to commemorate the end of the Russia-Netherlands cross-year. There was another purpose however: smoothing the "rough edges" of Russian-Dutch relations, as it was phrased by President Vladimir Putin. "I'm sure we will settle everything in the spirit of friendship," Willem-Alexander said. But something "in the spirit of friendship" seemed to go wrong as the king. After meeting the president earlier, proceeded to the concert of Amsterdam Royal Orchestra at the Moscow Conservatory. Victoria Kuznetsova and Denis Kudriavtsev, two activists of The Other Russia protest movement, attempted to pelt the king with tomatoes near the conservatory, shouting, "Your hands are in Dolmatov's blood!" The case of Alexandr Dolmatov is has been a sticking point for the two countries. Dolmatov was the member of the National Bolshevist Party prohibited judicially for extremism, and an activist of The Other Russia, a nonregistered party. He participated in a number of protest actions, and served a one-year sentence in prison. On May 6, 2012, Dolmatov was seized at an anti-Putin "March of Millions" in Moscow. After his release, he asked for political asylum in the Netherlands, but was denied. Dolmatov hanged himself in a deportation jail in Rotterdam on January 17, 2013. He wrote in a death note that he did not want to be a traitor. Eduard Limonov, a writer, politician, and the leader of the National Bolshevist Party and The Other Russia, asserted that Dolmatov's death was connected with NATO special services, with which Dolmatov, an engineer with a restricted missile-production enterprise, refused to cooperate. It was the first time that the opposition said they had grounds for blaming western officials along and not just Russian authorities. Queen Beatrix of the Netherlands called Dolmatov's death "a great tradegy." An investigation revealed that Dolmatov had been taken into custody illegally for the period in which his appeal was under consideration. However, according to human rights advocates and Dolmatov's relatives, the guilty ones have not been punished yet. The incident with the Dutch royalty was not the first action taken by the National Bolsheviks related to Dolmatov's death. In January, the protested near the Dutch representative offices in Moscow and St. Petersburg. The king’s visit to Moscow was another opportunity for the group. "I think, everything happened on impulse, having learned he was going to the conservatory, they rushed there,", Maxim Gromov, a The Other Russia activist and former political prisoner, told RBTH. "The reason is clear: it is a reminder to the Netherlands that the Dolmatov conflict is not settled, and a demand that the investigation should be brought to a conclusion and murderers punished." Police in Moscow arrested the activists and charged with disorderly conduct. Still, there are other "rough edges" between the two countries: the Arctic Sunrise Greenpeace vessel detention by Russian security service for the crew’s attempt to board the Prirazlomnaya drilling platform in the Pechora Sea; and a number of incidents with both countries' diplomats; and a defiant statement from the Dutch foreign minister about preparedness to accept Russian gays if they are subjected to prosecution. Surprisingly, none of those things hampered active cultural and economic ties of Russia and the Netherlands during the specially designated year. The Netherlands were granted honorary member status at the St. Petersburg International Legal Forum held in May, and a St. Petersburg economic forum in June took place under the Netherlands sign. There was shipbuilding, navigation and ocean development exhibition held; and more than 130 events of cultural programs - concerts, exhibitions, festivals, performances. Exhibitions included Piet Mondriaan, the great Dutch avant-garde artist in the Tretyakov Gallery; in the Museum De Lakenhai of Leiden, the "1900 — 1940 Utopia" Russian avant-garde exhibition; in the Stedelijk Museum of Amsterdam, the exhibition of Kazimir Malevich, the father of Russian avant-garde; the Russian cinema retrospective show in Amsterdam; and “Giselle” and “Konyok-Gorbunol” staged jointly by the Nederlands Dans Theatre and St. Petersburg Mariinsky Theatre. The cross-year opened on April 8, 2013, when Putin visited the Netherlands at the invitation of Queen Beatrix (the present king's mother, who stepped down earlier this year), and it lasted less than a calendar year. The official closure has taken place. Despite the attack by activists, King Willem-Alexander and Queen Maxima visited Concertgebouw Royal Orchestra concert at the Moscow Conservatoire nevertheless. But joint projects are yet forthcoming, and in the nearest future: the Netherlands are declared the special guest at non/fiction book fair, it will start on November 27 in Moscow. And problems that accrued for this year will be due for settlement.